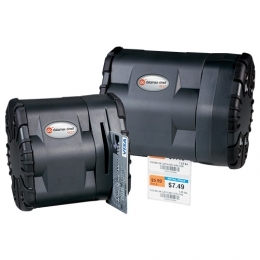 The OC Series of mobile direct thermal printers from Honeywell is the right choice for numerous applications in retail, healthcare, hospitality, and logistics, as well as for usage in the field. The printers support the printing of graphics, barcodes and, of course, text. Depending on the model, the 2 and 3 model variants print proof-of-receipt and payment slips, tickets, labels for shelf labelling, for laboratory samples and patient files with the OC3 label printers you even print patient wristbands. In order to make using the ergonomic printers as easy as possible, all models in the series feature a drop-in function for media. Thus, users quickly change the necessary rolls and keep interruptions to a minimum. Via the serial interface you connect nearly every mobile computer to the printers. For simple wireless data transfer choose the optional Bluetooth or 802.11 b/g Wi-Fi. Also optionally available is an upgradeable magnetic stripe reader for simplifying electronic payment processes. The battery comes included with the delivery.